Mothers breastfeeding their babies while waiting their turn to see the doctor, a nun standing nearby. Paris, France, August 1946. Really? Did women just whip it out and bare it all feeding their babies in those days? Maybe in France. My dad, born in 1940 here in the States, was fed evaporated milk mixed with corn syrup (or sugar) from a glass bottle. My grandma's doctor told her it was "the modern way" to bottle feed him rather than to breastfeed, so she didn't even try. My other grandma, birthed 3 children in India from 1940-1945, and said she "had" to breastfeed them because she couldn't get milk for them, due to the war. She always felt "like one of the native women." (her words & attitude) My impression was, had she been in the States, she'd have "been able to feed them the 'right' way." Both stories have always made me sad, because of the attitudes behind them. And here are these French women just about naked from the waist up. I think both of my grandmas would have died before being seen like that. Anyone have a more accurate sense (than mine) of how things really were? Is this how it was done? In Europe? I love these old pics, Christine! 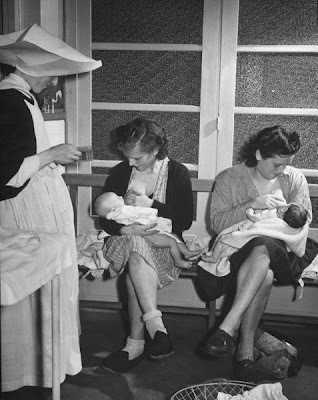 I'm fascinated by the attitudes throughout time regarding breastfeeding. how was it that someone convinced american women that breastmilk was not best, and society switched to formula? i mean, how was that bit of dumbness accomplished? was it done from the perspective of "best nutrition for the baby" or from the perspective of "it's not good to have to bare your breast at a moment's notice possibly in a public place?" I think some of it was done with the mindset of formula companies...whether that being the carnation brand of evaporated milk or whatever the first off the shelf formula was. I'm sure it happened the same way as pharmaceuticals work today. They 'sell' their product on the Dr. and the Dr. then starts to recommend it. Especially in a day when people didn't question medicine that much. We're having some issues with our son (home from Haiti for nearly a year) and your youtube videos have been especially helpful. THANK YOU!